As hard as it is for me to believe, this labor of love has been going for five years today! What have I learned in those five years? 1. That blogging isn’t easy. 2. That people actually read the blog. 3. That people around the world find Proof That blog by interesting Google searches. 4. That talking to people who read it and have ideas for topics is super rewarding. 5. That something I kind of started on a whim is now a passion. For all those things, I thank you, my faithful readers. Thank you for reaching out with potential topics or with your own Grammar Giggles (and please keep them coming!). Thank you for stopping me when you see me at a conference or online to let me know you’re reading and getting something useful out if it. Most of all, thank you for continuing to read, for gently correcting me when I screw up, and for giving me faith that I just might be making a difference in this big ole world. 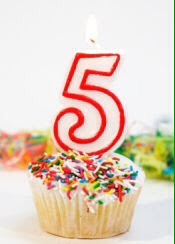 So happy 5th blogiversary to everyone who has subscribed, stumbled upon, and shared this blog with others. You are why we keep doing what needs to get done. This was sent to me and, if true, is heartbreaking to me. This isn’t that difficult. 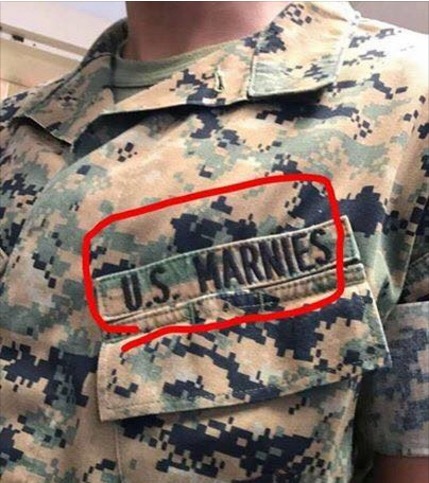 I have the utmost respect for our armed forces so seeing this kind of an error is harder to see than most. Counsel – an easy (although perhaps inappropriate) way to remember this one is that an attorney “sel”ls his or her advice. I found this when looking at the catering menu for the suites at Chase Field for an Arizona Diamondbacks game event. The one thing you always should get right is the name of the team for which you are catering food to its fans. Song Lyric Grammar Errors . . . or Not? 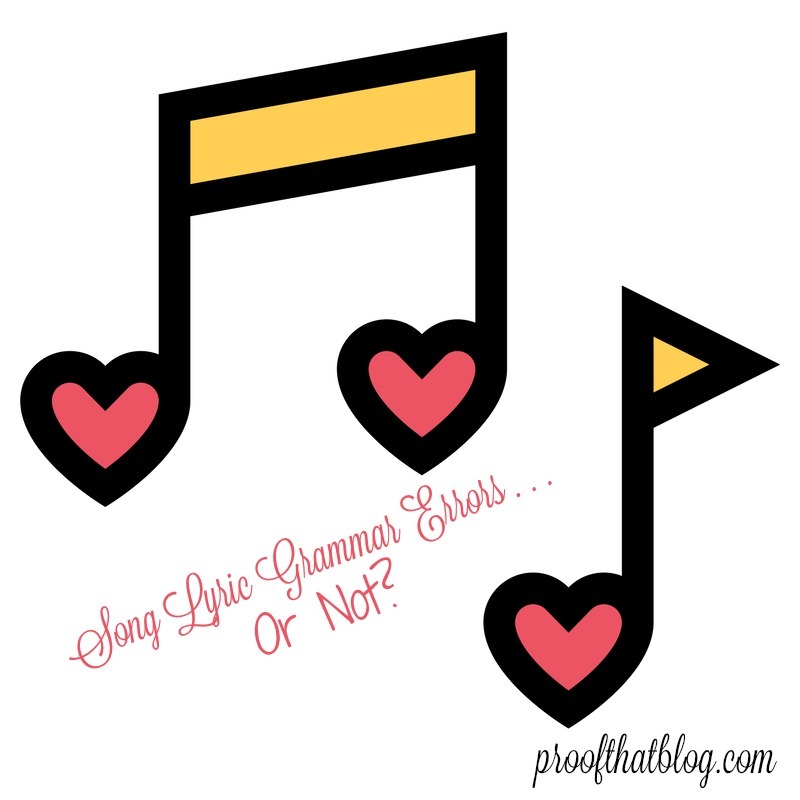 Comments Off on Song Lyric Grammar Errors . . . or Not? Apparently the Princeton Review (which helps US students prepare for college admission tests) had an example of “Grammar in Real Life” using some song lyrics for students to find the errors. One of those examples was Taylor Swift’s song Fifteen. The Princeton Review said the lyric read “Somebody tells you they love you, you got to believe ’em.” A Swift fan was upset and posted a copy of the test page online. Taylor herself replied that they got the lyric wrong “Not the right lyrics at all pssshhhh. 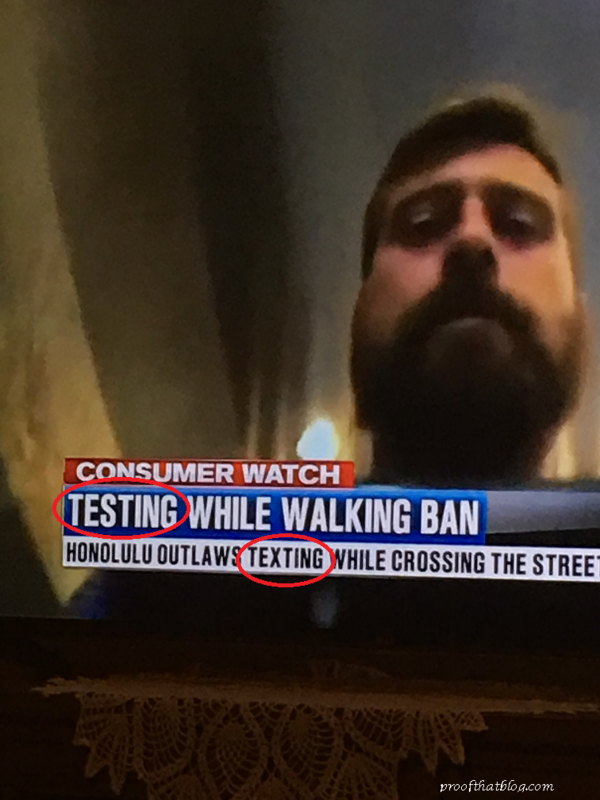 You had one job, test people. One job.” and that the correct lyric was “Somebody tells you they love you, you’re gonna believe them.” Princeton Review owned up to that error, but posted that the revised line still had a grammar error because “somebody” can’t later be referred to as “them.” “If we look at the whole sentence, it starts off with ‘somebody,’ and ‘somebody,’ as you know, is a singular pronoun and if it’s singular, the rest of the sentence has to be singular.” They apparently forgot, however, that “them” is a gender-neutral, singular pronoun that has been used that way since the 16th Century. So that sentence is actually grammatically correct. Go Taylor! The same Princeton Review test referenced a Lady Gaga song saying the lyric “You and me could write a bad romance” is grammatically incorrect. OK, you’re correct there. In formal writing, it should be “you and I” EXCEPT song lyrics are not formal writing and “you and me” is what people say all the time, so it is acceptable in what we will call “musical speech.” Go Gaga! It is admirable for Princeton Review to attempt to test grammar using real life examples, but they need to make sure their answer is correct first. 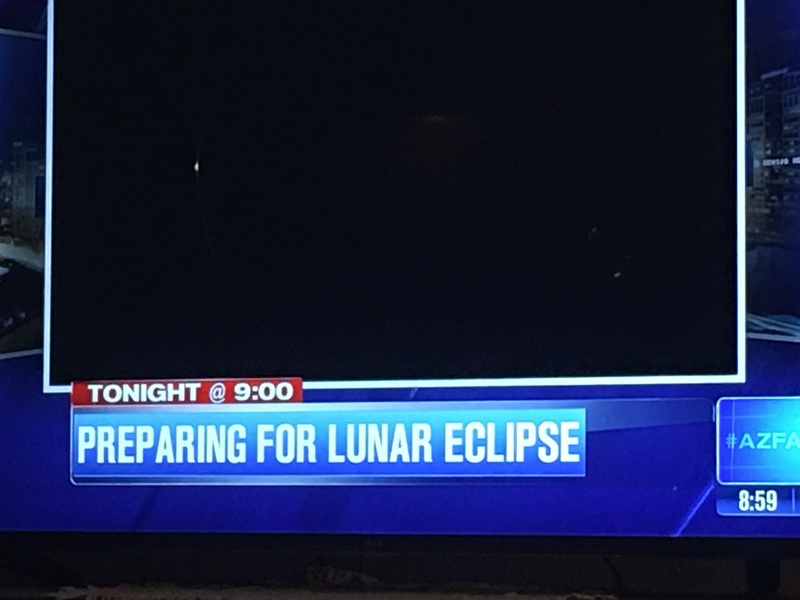 In a timely finding on my local news station, this was one of their headline stories. Unfortunately, a lunar eclipse is when the earth sits between the sun and the moon while a solar eclipse is when the moon sits between the Earth and the sun. Today’s event (which the station has talked about all week) is a SOLAR eclipse. A friend sent me this from an article she was reading. This is something spellcheck wouldn’t catch, and is probably something the author read knowing what it was supposed to say, so that’s what the author saw. Perhaps taking a step away for some time would have helped the author read what it actually said. 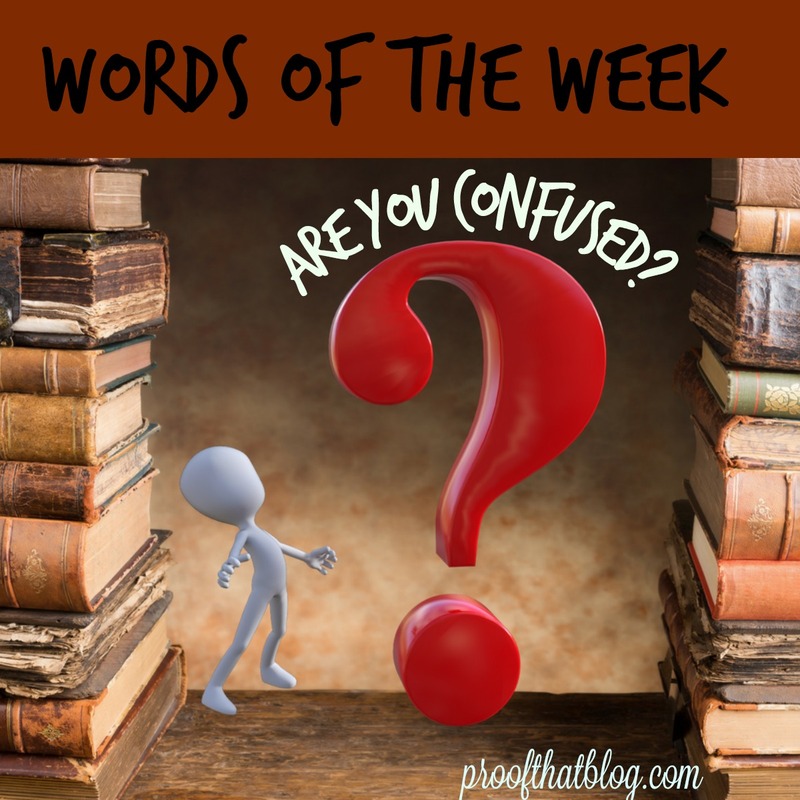 It’s time for “Confusing Words of the Week” where I take a set of two or three words that get confused and give you definitions and try to give you a memory trick to help you remember when to use which word. If you have words that confuse you, use Ask PTB or send an email to proofthatblog@gmail.com and they may appear here soon! Joe was trying to wangle an invitation to the party. It seems that politicians love nothing more than to wrangle with opponents. A friend sent this to me. They got it right in one place, but obviously not in the other. 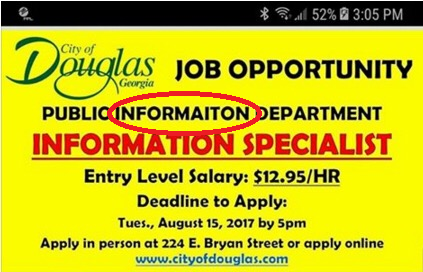 Maybe they should be hiring a proofreader instead.